Liaison with Community Workers at Jabiru Community Youth Services, Koobara Kindergarten and local Primary Schools, ascertained that some children in the Zillmere, Taigum and Bracken Ridge communities were not adequately prepared for the potential challenge of transitioning to prep. Building on the trial of a transition to prep program initiated by Jabiru the previous year, Sing&Grow was able to offer evidence-based early intervention for families with young children to support successful transitions to school. Sing&Grow, Jabiru Community Youth Services, Koobara Kindergarten, and Zillmere and Taigum State Schools collaborated to deliver engaging and effective transition to prep programs in Term 4 2013 and Term 1 2014. Family engagement with local services (Jabiru and Koobara) enabled the referral of families to Sing&Grow as a soft-entry transition into the school environment. Off to School was delivered as a trial program, being piloted by Sing&Grow for the first time. 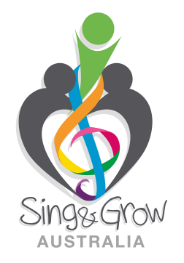 It aimed to target the specific developmental needs of children transitioning to prep (thus extending Sing&Grow’s traditional age bracket) and allowed families to participate in hands-on music activities, assisting children with developmental skills and extending the repertory of parenting skills through interactive play. Known song material, original compositions, singing, movement to music, relaxation and instrumental play were all incorporated into an established session plan, with a resource CD made available to each family to further support families’ capacity to use musical activities at home. Additionally, the program provided a warm referral pathway with families being introduced to Jabiru staff (located in Zillmere State School) to build familiarity and confidence for the prep transition. The Sing&Grow Off to School programs were further supported by Jabiru Community Youth Services who provided students with ‘take home packs’ (including a drum!) to support the sustainability of the outcomes achieved in the programs, as well as to maintain an ongoing relationship with families. By the completion of programs, parents reported noticing improvements in all developmental domains of their children, particularly highlighting growth in confidence and social skills including the ability to share, take turns and interact positively with others in the group. Parents were also observed by Sing&Grow and school staff to increase their interactions with others in the group, indicating that the group environment provided opportunity for connectedness and social support for them. Following the conclusion of the programs, the principal of Zillmere State School, the Vice-Principal of Taigum State School and Prep Teachers met with the Sing&Grow and Jabiru staff. All reported that the program had been of significant benefit to their school community and that they witnessed the development of the children over the 10 week period. At Zillmere State School, the Prep Teacher detailed how she utilised some of the same concepts from Sing&Grow in the classroom, and extended the children’s learning and experiences from Sing&Grow throughout the week.